from All Kinds of PM-bearing Waste. Computer Associates’ (CAI) NAV for E-Scrap Recycling is fully integrated business management software designed specifically for e-scrap material processing and inventory management. 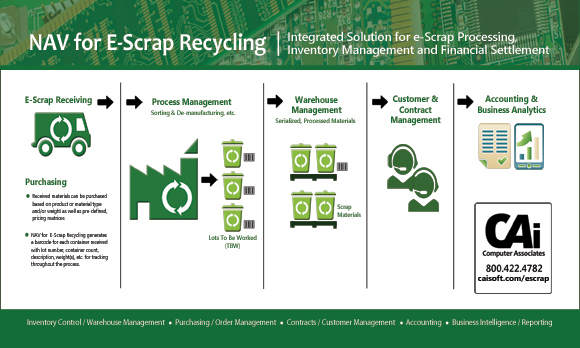 The software helps e-scrap processors improve efficiencies and reduce costs while simplifying the tracking of raw materials from receipt to decomposition and through to financial settlement. Get complete control and visibility of recycled materials and post-processing by-products to help you improve efficiency, accuracy, and business analysis while maintaining full Chain-of-Command traceability. If you purchase scrapped Automobile Catalytic Converters and recover Platinum Group Metals (PGM), specifically Platinum (Pt), Palladium (Pd) and Rhodium (Rh) and/or you are involved in the smelting or further downstream processing of auto catalysts, our NAV for Catalytic Converter Recycling Add-on is an ideal business management solution. NAV for E-Scrap Recycling is based on Microsoft’s popular Dynamics Enterprise Resource Planning (ERP) software, an integrated, adaptable business management solution that can streamline processes, deliver robust reporting and business intelligence, and connect employees, customers, and partners across a global marketplace. Microsoft Dynamics works like and with the other Microsoft Office® and products people already use, helping to ensure a smooth implementation, minimize training requirements, and provide a solution that can move your company into the future. CAI has been providing software solutions to precious metals refiners, smelters, mining companies, precious metals brokers, non-ferrous metal recyclers and e-scrap processing businesses for more than forty years. Our clients are located throughout the U.S., Europe and the EMEA region.